The Case for Folding Pocket Aces: Should You Ever Consider It? Consider whether you would fold pocket aces in this online micros hand analyzed by @BlackRainPoker. Folding pocket aces is never fun, but sometimes what happens postflop dictates that you should. Folding pocket aces at the lower limits is something that is particularly difficult to do, especially for a lot of newer poker players. While you should be willing to put all your chips in the middle with them very frequently after the flop, there are a few occasions where you might want to consider making a tough fold instead. Before I begin though, I want to point out that this is a very small stakes specific thing. This is because there are a lot of weak-tight players at these limits. What I mean by that is players at these limits don't really have too many bluffs in their range. When a tight-passive player is raising you on the turn or the river in particular, it is usually because they have it. By contrast, there exist more highly-skilled opponents in mid- and high-stakes poker games who have developed a considerable bluffing range in these situations. This is not to say that those players won't also frequently show up with the nuts in spots where that's what they are representing. It just means they have learned to balance their play with at least a few bluffs as well. In this hand we are up against two players and the main villain in the hand is the typical weak-tight low/micro stakes player I mention above. He comes in for a raise preflop and then calls a slightly under-sized three-bet. This is a classic spot for set mining in full ring cash games in particular. 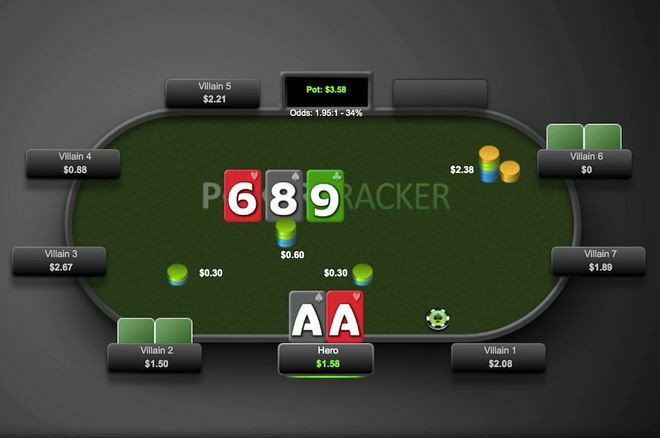 Tight-passive players also love to call in position here with all sorts of small and middle pocket pairs as well as some suited connectors from time to time. Now this flop absolutely nails that range. Several of those mid-pocket pairs have a set, and nearly all of the suited connectors smashed this flop as well making two pair, a pair plus a draw, and so on. The action starts with us in the small blind and we make a standard continuation bet. The big blind calls and then the tight-passive player decides to ship it all in. This is exactly one of those spots at the lower stakes where you very much need to consider folding your pocket aces. This player type in particular is just not one to be making this play without the goods. Another very important point to consider is that he is raising not just one person, but two. This is a crucial point to understand when trying to figure out what various lines mean at the micro stakes. There are definitely going to be situations where somebody will attempt a crazy bluff versus one player. But against two? Not likely. This is therefore a situation where if we call we are going to get shown a set or two pair a very high amount of the time. So I really like the fold here. But I want to know what you guys think! Maybe you disagree and you would have made the call. Let me know your thoughts in the comments below on what you would do in this situation. Are you ever getting away from aces here?